The Detailed Dragonfly Thinlits have been one of my favorite die sets over the last few months. I love the variety of ways that you can use them. This is a simple card that is very relaxing to make. I created it for a swap and liked it so much that I made more of this design as thank you cards for some of my customers and a couple more for birthday cards. As it usually goes, I kept the one with a crooked sentiment for my sample! I should have taken a photo of one that was straight before mailing them all out. The base is Basic Black cut at 4 1/4" x 11' and scored at 5 1/2"
The Berry Bliss layer is 4" x 5 1'4" and was embossed with the Big Shot using the Seaside embossing folder. I chose to use it on the card with the raised side of the paper adhered to the basic black base. I used Multipurpose Liquid Glue to adhere the Berry Bliss layer to the card base. Whisper White cardstock was run through the Big Shot using the largest of the Lots of Labels Thinlits. Leaves from the Butterfly Basics stamp set are stamped in Old Olive on the white panel. 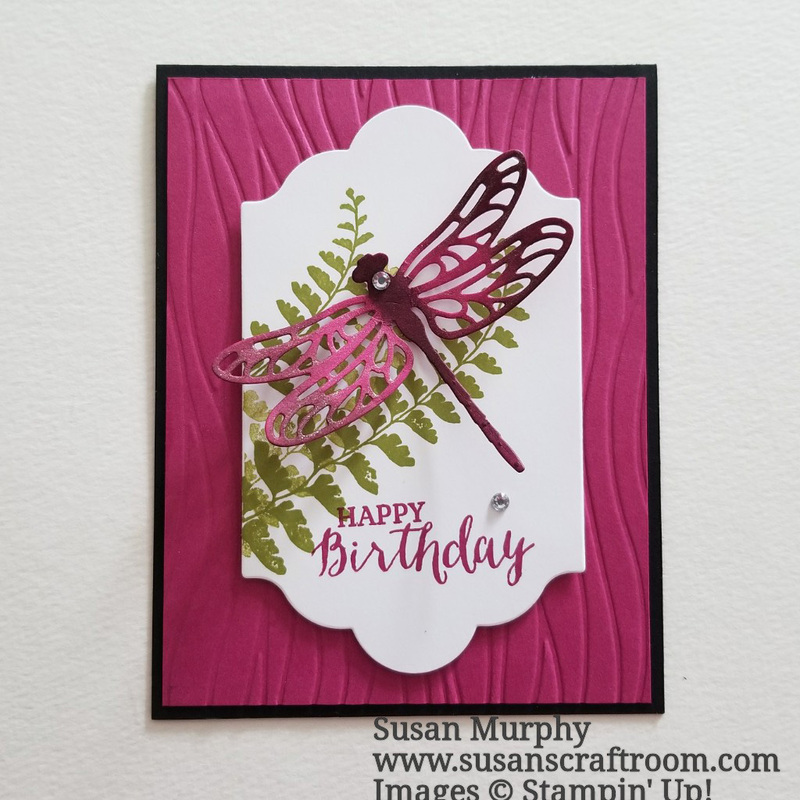 The dragonfly was cut out of Berry Bliss cardstock using the smaller single dragonfly thinlit from the Detailed Dragonfly Thinlits set. Using sponge daubers, I added Fresh Fig ink to the body of the dragonfly and the tips of it's wings. Wink of Stella was brushed on the wings to give it a bit of sparkle. I used glue dots to attach the body of the dragonfly to the whisper white panel so it is resting on the leaves. A couple of Basic Rhinestone Jewels finished off the front card panel. The stamped card piece was attached to the main card using Stampin' Dimensionals to add a bit more dimension. I hope you like the card as much as I enjoyed making it! If you click on any of the card supplies listed below you will be taken to that item on my website.